In microwavable bowl, microwave 1 cup of the broth and salt on High 1 minute. Stir in saffron until broth turns an orange color and salt dissolves; leave saffron threads in broth. In 4-quart Dutch oven, heat oil over medium-high heat. Add shallots; cook 1 to 2 minutes, stirring frequently, until translucent. Add garlic, thyme and parsley; cook 30 seconds to 1 minute (do not burn garlic). Stir in rice until coated with oil. Stir in saffron broth. Reduce heat to medium; add wine. Cook about 2 minutes or until wine is almost evaporated. Cover; simmer over medium heat 20 minutes, stirring occasionally. Continue to cook over medium heat, stirring in about 1/2 cup broth every 5 minutes until all broth has been added and mixture is creamy. Stir in cream and shrimp. Reduce heat to medium-low; cover and cook until shrimp are pink and rice is tender. Stir in Parmesan cheese. Serve immediately. You might need extra chicken broth. If desired, substitute white onion for the shallots. If desired, serve with extra Parmesan cheese. 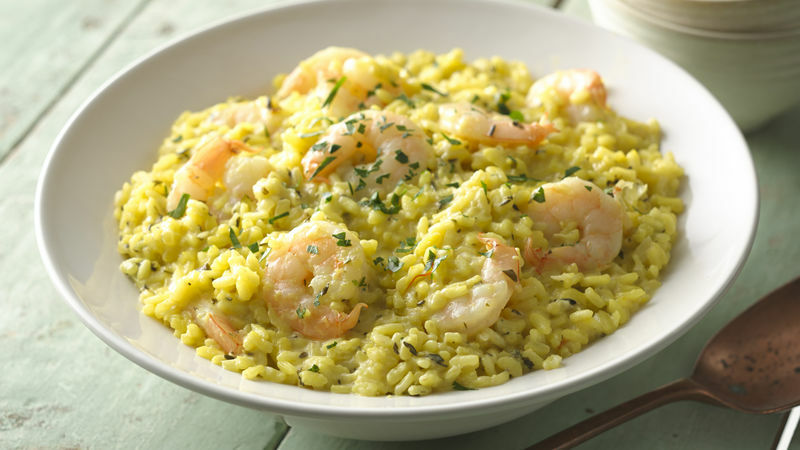 This exquisite risotto with saffron and shrimp will be remembered by all your guests!